As you can see, this is not a crazy savory cocktail to be confused with the brunch-friendly champagne and orange juice beverage. Mimosa in French culinary terms refers to finely grated or seived hard-cooked eggs frequently used to dust salads and vegetables or as a component of deviled eggs. You might understand why the eloquent-minded Français would prefer the term “mimosa” for such a preparation. Not only is it poetic and mellifluous, it’s also apt: the crumbled canary yellow yolk of the egg resembles the brilliant mimosa flower which blooms in early Spring. Spring is also the time for asparagus, and asparagus dusted with mimosa is a popular and elegant preparation. I took this recipe one step further and turned it into a healthy yet light main dish, serving the asparagus on a bed of nutrient- rich quinoa tossed with olive oil, lemon and mint. I dare say it would make a wonderful addition to any brunch menu – accompanied by champagne and orange juice (naturally). Place quinoa, 2 cups water and 1 teaspoon salt in a medium saucepan. Bring to a boil, then reduce heat to medium-low. Simmer until the quinoa grains are tender and release their white “tail”. Drain and transfer to a bowl. Add 1 tablespoon olive oil and toss to coat. Set aside to cool slightly. Heat oven broiler. Arrange asparagus in one layer on a rimmed baking tray. Drizzle with olive oil and lightly season with salt. Turn to coat. Broil on the top shelf until crisp tender, 2 to 3 minutes, shaking the pan once. Add 1 tablespoon mint and 1 teaspoon lemon zest to the quinoa. Stir to combine. Spoon the quinoa onto a serving plate. Place the asparagus on top of the quinoa. Squeeze the juice of 1/2 lemon over the asparagus and quinoa. Press the egg through a sieve with medium-sized holes over the asparagus. Sprinkle with sea salt flakes, additional mint and lemon zest. Serve warm or at room temperature. Beautiful colors – such a healthy dish. I can’t seem to get enough fresh spring asparagus! 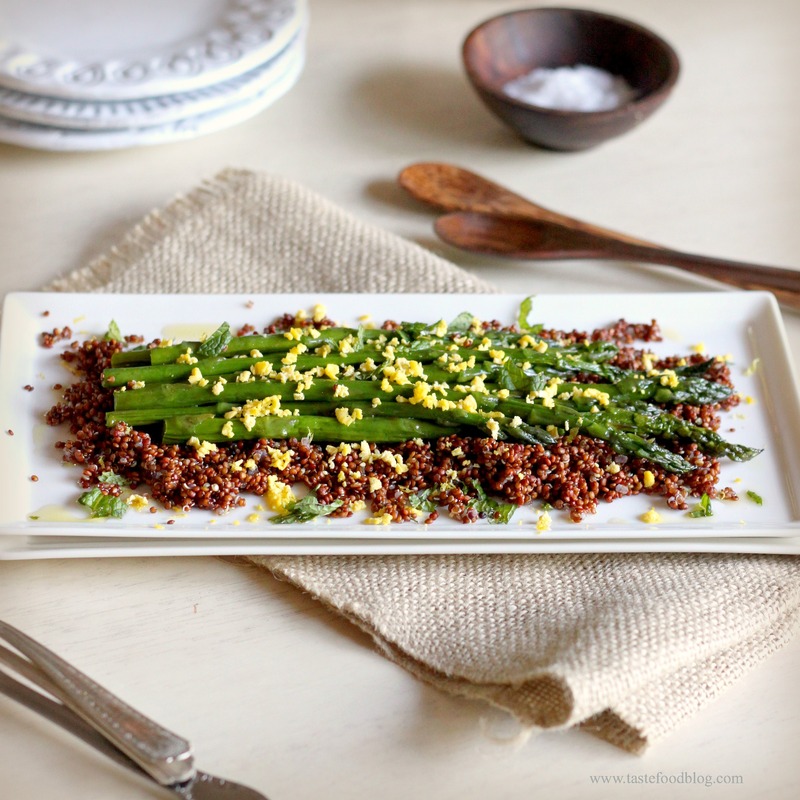 My family would love the verdant green asparagus atop a bed of red quinoa! That is a beautifully presented dish! I really love the way you prepared your asparagus. Tasty and healthy. Oh, this looks amazing. I’ve been meaning to make asparagus mimosa since I saw it in the Plenty cookbook. I love that your version uses quinoa. Wow that looks good. The asparagus has been tempting me at the farmers market too! Delightful recipe and a simple one to make, even tho’ Down Under I’ll have a bit of a wait for fresh asparagus! Don’t remember using quinoa in the dish, so surely will have to bookmark for a few months down the track . . . 🙂 ! Love the protein kick of the quinoa in this dish, adds a whole level of “pretty” too! When I first saw the photo, I thought the quinoa was crumbled bacon. Now THAT would be a yummy dish, but I guess it would kind of negate the “healthy” part of things, wouldn’t it? Pingback: Five Good Things: Tuesday | justb. A stunning dish, Lynda! I’m adding this to our Mother’s Day brunch menu. Yum! I’m hosting a link party tonight and would love for you to link up some of your recipes!